The 20th anniversary AfricaCom is just two weeks away and we've been catching up with those at the forefront of shaping 'Digital Africa,' as well as those you are likely to meet and hear from on stage at this year's event. 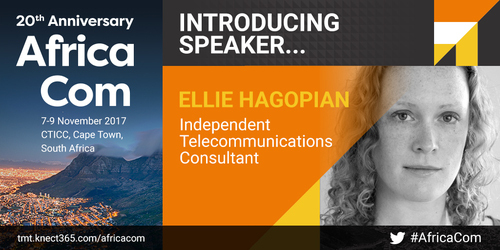 Ellie Hagopian is an independent consultant based in Johannesburg, the former Chairperson and current Treasurer of the Wireless Access Providers' Association of South Africa and former CEO of Skyrove, as well as Chairperson of the Connecting Africa track at AfricaCom 2017. We sat down with Hagopian to discuss what first drew her to the African telecommunications sector, what she is most looking forward to at the 2017 event, and what the next big thing in industry is likely to be. Connecting Africa: We are looking forward to welcoming you to the 20th anniversary of AfricaCom, where you will be serving as moderator for the Connecting Africa track. What can delegates expect from these sessions? Ellie Hagopian: Oh wow, I didn't realise it was the 20th anniversary! Fantastic. The Connecting Africa track will be covering aspects ranging from different approaches to connecting the unconnected (satellite to fiber to 5G), as well as the importance of connectivity for economic development and considering government initiatives in broadband. We'll also be discussing the best ways for the public and private sector to work together. Connecting Africa: As an American ex-pat, what has drawn you to the African telecommunications sector and to set up your own Johannesburg-based consultancy? Ellie Hagopian: I arrived in Africa quite by accident, having visited here for three weeks in 2009 when getting my MBA, and I just fell in love with South Africa. Setting up my own consultancy was also an accident -- after my time as CEO of Skyrove, I founded a firm specialising in strategy and implementation services but wound up enjoying the strategy and consulting aspects more, so that is where I now spend most of my time. Connecting Africa:	What excites you most about working in the African telecoms sector? Ellie Hagopian: What I love about working in Africa is the scope of the challenge. You see crazy things coming out of Silicon Valley, like Wi-Fi enabled salt shakers, and I question the use of capital and human ingenuity into such things of arguable utility. In Africa, we have to sharpen the focus a bit on what really matters, and how to deliver solutions for more challenging environments in terms of income, as well as other infrastructure such as access to electricity. It's so fascinating -- it's changing every day and if you get things right you can positively impact a lot of people. That is what gets me really excited. Connecting Africa: Which was the first AfricaCom you ever attended, and how have you seen it change and develop? Ellie Hagopian: My first one ever was 2012. It's certainly gotten a lot bigger since then with a lot more streams. One of the hardest things is the desire to be in five places at once, as well as visiting the huge exhibition area. Connecting Africa:	What are you most looking forward to at this year's event? Ellie Hagopian: The cocktail parties? In all seriousness, seeing friends and colleagues, not just from all over Africa, but from around the world. This is the most important event on the African telecoms calendar. Anyone who is anyone is at AfricaCom, and a lot of people who aren't even from telecoms but are looking at things like smart cities or telecoms-enabled functions will also be there. It's a great mixing pot and place to meet people. Of course, moderating one of the streams is a great honor and I always enjoy preparing and leading panel discussions because it deepens my insight into the subjects under discussion. Connecting Africa:	How would you describe AfricaCom in three words? Ellie Hagopian: Multifaceted telecoms reunion. Connecting Africa:	Would you or why would you recommend AfricaCom to others in your sector here and abroad? Ellie Hagopian: It really is the place to come and meet anyone and everyone in the sector. I tell this to my European colleagues who may be on the fence about coming. Connecting Africa:	What are you most looking forward to at the 20th anniversary AfricaCom? Ellie Hagopian: Anniversaries are always an opportunity to be reflective both past and future. Ten years ago the sector was very different from how it is now. I can't imagine how it will be in ten years, and that's the fun and challenge of it! Connecting Africa:	If there is one area or region of telecoms people should be keeping an eye on, what would it be? Ellie Hagopian: Software, specifically data science and machine learning. The amount of manual design, configuration, and tweaking of networks is amazing. Most machine learning algorithms or network 'self-healing'/'self-configuration' are rudimentary at best, but when we start to have vendor-agnostic tools that can literally optimise our networks and tell us where to build next and with what technologies, then we can really start to apply our minds to value-added services (the much-vaunted services-based competition), optimising the human side of the customer interactions, and using the network to do new kinds of things. Spectrum sensing and dynamic spectrum management is a close second. The way that we manage spectrum now is archaic and inefficient, and when we get this right it's going to open even wider the doors for wireless broadband as well as more and more options for IoT. It really is an exciting time to be in the industry! From using connectivity as a tool for socio-economic development to disruptive TCO and industrial internet revenues, the Connecting Africa track will be taking a comprehensive look at the African connectivity landscape at the 20th anniversary of AfricaCom (7-9 November 2017). Take a look that the full three-day agenda, topics and speakers here. As an AfricaCom delegate, you will have exclusive access to all 16 immersive AfricaCom conference tracks, the Visions for Africa keynotes and the packed networking agenda, including the AFest music festival, delegate networking drinks and the AfricaCom Awards and afterparty. 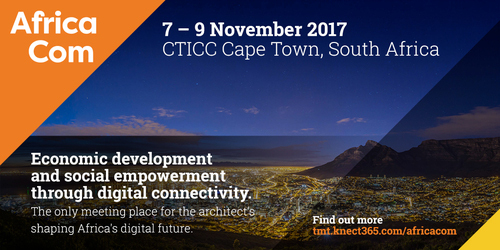 Find out more about the AfricaCom delegate experience here and purchase your delegate pass here . The addition of the AI Summit, IoT World Africa and an Enterprise Digital Transformation track at this year's AfricaCom event will highlight the opportunities that new technologies can bring to corporates. Africa's digerati are set to converge on the annual AfricaCom event in Cape Town once again to figure out the continent's connected future, analyse the potential of 5G, identify how IoT and smart cities could play a role in Africa's digital development… and much more. Ahead of AfricaCom, Connecting Africa spoke with NAGRA's Guillaume Hallez, to hear his thoughts on the future of the pay-TV market in Africa and more. Bradley Shaw from NuRAN Wireless talks about Africa's networking needs and the impact that mobile connectivity can have on communities.